This morning we’re taking a peek at the official Samsung Galaxy Note 10 video seemingly leaked by Samsung itself. 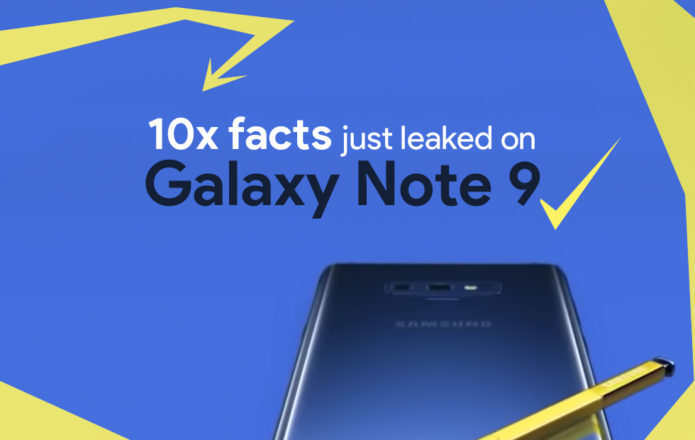 This video shows the Galaxy Note 9 in all its very Blue glory, complete with yellow S Pen, and the body of a champion. Up close and personal we’re able to see a whole lot of detail we might not have been able to discern in the past with less-official renders – now we’re more sure. There’s a distinct difference between the yellow at the head of the S Pen and that of the bumper back. The main bulk of the S Pen is a flat yellow, while the rear end is shiny. This isn’t entirely unlike past models, but here with yellow – a color never before delivered by Samsung – it’s set to be darned interesting. Especially in combination with the Blue of the phone and of the clicker. Much like the Galaxy Note 8, the S Pen will be near-flush with the bottom of the phone. When embedded in the phone, there’ll be just the slightest of bumps at the bottom. This bump will pop out if pressed in, revealing the S Pen ready to be pulled out. Simple and smooth. If I’m not mistaken, this image showing an X-ray sort of see-through vision of the S Pen removal shows no latch. There was a sort of latch lock included in one notoriously silly Galaxy Note 5 and 7 mishaps. No worries, all you accidental backwards pen-poppers. It’s all smooth sailing now. Remember that flaw back in the day? There’s still a possibility that if your S Pen is jammed in backward that the clicker will click in, and the entire stylus will be difficult to pop back out. But we’ll cross that bridge when we get to it. For now, courage. There’s still a bit of a bump for the camera array at the back of the device. Here it’s shown as clear as we’ve seen it yet. It’s not massive, but it is there, a bit more than it was there before, unless my eyes deceive me. The rim of the Blue version of the Galaxy Note 9 is blue, and the antennae are blue as well. There’s so much blue here you’ll flip. Even the clicker of the yellow S Pen is blue. With the Brown and Lavender and Black versions we’re expecting very similar color-matching metal rims, but with matching color S Pens as well. This yellow madness stands alone in that respect. We’re allowed a look at the SD card slot – the micro-SD card slot, that is – here in this preview video. The video shows the device rolling with a 512GB card. They also mention how much storage the device could carry in total. Samsung mentions here the possibility that the Galaxy Note 9 could roll with 1-terabyte of storage. When they mention this, they show the micro-SD card slot pushing in 512GB additional storage. This essentially means that Samsung’s confirmed a 512GB internal storage size edition of the Galaxy Note 9 – but haven’t confirmed whether it’ll be available in all regions. When Samsung suggests they’ve got a “Powerful all day battery” there’s a disclaimer at the bottom of the video. In that video they mention they’ve done tests on a pre-release version of the phone SM-N960 (Galaxy Note 9) in its 128GB edition. That basically confirms the existence of said version of this phone. This video concentrates on local storage a whole lot. This doesn’t necessarily mean anything entirely solid other than the fact that they’re pushing the Galaxy Note 9’s ability to store a whole lot of media. BUT, if we wanted to take a stab at the possibilities of the future, we might suggest that Samsung’s leveraging its hardware manufacturing powers – especially those of mobile-sized data storage – over those of cloud-based storage options now and in the near future. This device will almost certainly still be launched with the Google Photos app, of course. That means all the cloud storage for photos you could possibly ever need – at slightly less-than-original storage quality. Unless you want to pay! While this is a rendering – completely and utterly – Samsung’s more than once emphasized the shiny, reflective nature of the Galaxy Note and S Pen. The tail end of the S Pen is reflective and shiny and the entire back of the Galaxy Note 9 itself is obviously glass, and not at all against the idea that it, too, is as shiny and reflective as possible. Have a peek at the timeline below for more information on this device. We’re expecting that Samsung will both reveal the device and its price/release information on August 9th, 2018. The device should cost under $1000 for its most basic edition, and will likely be put on pre-order within the week. In-store availability is quite likely set for the 24th of August – though we’ll juts have to wait and see for sure!